Each of the six bedrooms at Olerai House is unique, but all share a cosy comfort and an attention to detail that instantly inspires you to relax. Some have warm earth tones, others are painted with bright colours. All celebrate natural materials like wood, cotton, woven reeds and fired ceramics. Big comfortable beds with crisp cotton sheets and elegant mosquito nets welcome you at night. En-suite bathrooms are ready with plenty of hot water, organic lotions and shampoos, and hairdryers. Panoramic views of the gardens and the surrounding countryside spread through the large windows. 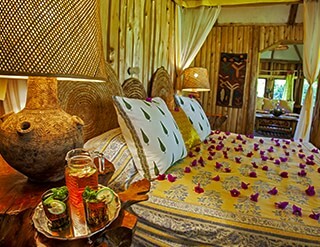 Up a flight of rustic wooden stairs overlooking the acacia forest is Chui bedroom, which means “leopard” in Kiswahili. It was from this viewpoint that a leopard was spotted making a kill, one evening, right next to the Olerai pond! The room is walled in thick cedar posts from the farm and has big windows that face the sunset. 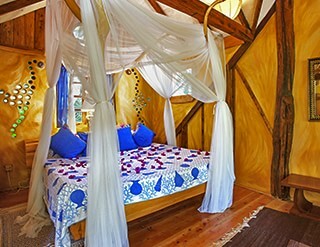 An elegant net hangs over the elaborate bed made from the twisted pale branches of an old jacaranda tree. Lying there it’s easy to imagine the serene comfort of a leopard snoozing in a tree, amidst the bright colours, soft lights, plump sofas and warm rugs that furnish this spacious and romantic room. Off the piazza from the main House, Swara room has two bedrooms with separate bathrooms, a private veranda, and is perfect for families with several children. On the lawn outside one sometimes sees the impala from which the room gets its name. 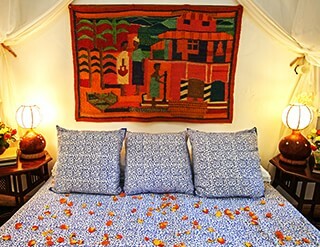 The spacious bedrooms are painted blue and white with walls hung with colourful African tapestries, and the floors are strewn with handcrafted rugs. 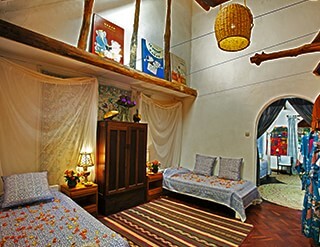 The atmosphere is airy and rejuvenating, perfect for relaxing family time away from the city. With its vaulted ceiling and large wall tapestry of the world’s tallest animal, this beautiful bedroom could only be called Twiga, the Swahili for ‘giraffe’. The large bed lies in the middle of the room beneath a circular net, taking full advantage of the room’s brightness and airiness. You could be lying there switching off from the world only to find your reverie interrupted by some of our resident giraffes arriving to nibble creepers from the roof above your head. The en-suite bathroom boasts a shower encased in a blue glass wall. Ndovu means elephant in Kiswahili, and the Ndovu bedroom has a history: it was a little writing room where Iain and Oria wrote their acclaimed books, Among the Elephants and Battle for the Elephants. Today, it is a beautiful wood-panelled space with an en-suite bathroom and big bay windows that look over green fields dotted with wildlife to the Rift Valley peak of Longonot in the distance. There is a big double bed, pretty printed materials, and an expansive curved sofa. It is a perfect place for you to curl up and switch off from the world outside, or perhaps be inspired to start on your own masterpiece? Across the piazza from the main House, this charming wood-panelled cottage was Iain and Oria’s bedroom. Side-tables hewn from fallen trees stand on either side of the large bed, and thick rugs keep toes warm on chilly mornings. There is an added sitting and writing room that looks out over the garden to the countryside beyond. Attached are an en-suite bathroom and dressing room. It is perfect for two, or we can happily add an extra cot for a little one. Every now and then a hippo likes to leave his calling card on the corner of the building, claiming the room as part of his range. 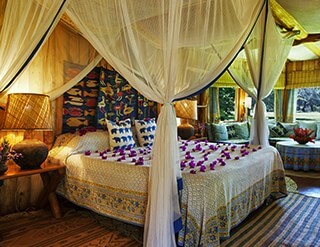 Tucked to the side of the main house, amidst a tangle of vegetation, is Nyati bedroom, meaning, “buffalo”. 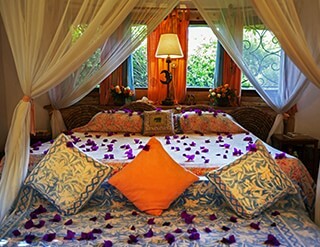 This is Olerai’s newest room, crowned with flowers, and deliciously private. A comfortable kingsize bed, and warm, inviting interior makes this the perfect room for getting away from it all. Late at night buffalo and hippo come to graze on the lawn, and you can hear the soft sighs of their breath as the strip off succulent mouthfuls of grass. Surrounded by wildflowers you can breathe deeply of the perfumed air.